Adam Robert Ottavino (born November 22, 1985) is an American professional baseball pitcher with the Colorado Rockies of Major League Baseball (MLB). 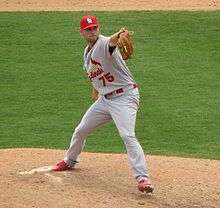 He made his MLB debut with the St. Louis Cardinals in 2010. Ottavino was born in Manhattan, New York, but grew up in Brooklyn after his family moved there when he was young. He graduated from the Berkeley Carroll School in Park Slope, Brooklyn in 2003. The Tampa Bay Rays selected Ottavino in the 30th round of the 2003 MLB draft, but he did not sign. Ottavino enrolled at Northeastern University, where he played college baseball for the Northeastern Huskies baseball team. Ottavino holds both the Northeastern career and single season records for strikeouts. In 2005, he was named America East Conference's Pitcher of the Year. Ottavino pitched for Team Italy in the 2009 World Baseball Classic. He pitched three scoreless innings against Venezuela in his lone appearance in the tournament. The St. Louis Cardinals selected Ottavino out of Northeastern in the first round, with the 30th overall selection, of the 2006 MLB draft. On May 29, 2010, Ottavino made his major league debut for the Cardinals as a starter. He appeared in five games for the Cardinals in 2010, three of them starts. On April 3, 2012, the Colorado Rockies claimed Ottavino off of waivers. He was brought back to the majors later that season, and developed into a relief pitcher. Ottavino wears uniform number 0, and is the first and only pitcher in major league history to have ever done so. Despite posting a 5-1 record, his ERA was close to 5 in 79 innings. In 2013, Ottavino appeared in 51 games, pitching in 78.1 innings and lowering his ERA from the previous season by 2 runs, registering an ERA of 2.64 for the Rockies. In 2014, Ottavino went 1-4 with a 3.60 ERA in a career high 75 games. After closer LaTroy Hawkins struggled to open the 2015 season, Ottavino was named the new closer. On May 4, 2015, it was revealed that Ottavino had a partially torn ulnar collateral ligament in his right elbow, which required Tommy John surgery, ending his 2015 season. Ottavino began the 2016 season on the disabled list. 1 2 3 "Former St. Louis Cardinals first-round pick Adam Ottavino took long road to big league success with Colorado Rockies – MiLB.com News – The Official Site of Minor League Baseball". MiLB.com. Retrieved March 25, 2015. ↑ "Northeastern University Athletics". gonu.com. Retrieved March 25, 2015. ↑ "Italy vs. Venezuela – Boxscore – March 10, 2009 – ESPN". ESPN.com. Retrieved March 25, 2015. ↑ "Colorado Rockies' Adam Ottavino to switch to No. 0 for MLB season". On the Rox. Retrieved March 25, 2015.